Shock new figures have shown that three chronic pain sufferers died while waiting to be seen by specialists. Chronic pain sufferers in the north-east are waiting far longer for treatment than elsewhere in the country according to the figures, which cover the first three months of this year. Chronic pain conditions are defined as any illness which stays with someone for the long-term such as fibromyalgia, ME, and chronic pain syndromes. In Grampian, the average waiting time is 42 weeks – more than double the second-highest, Ayrshire and Arran, at 21. Among patients who have yet to be seen at the pain clinic in Aberdeen, 54% have been waiting longer than the Scottish Government’s target 18 weeks. And a whopping 83% who have been seen have waited longer than 18 weeks. 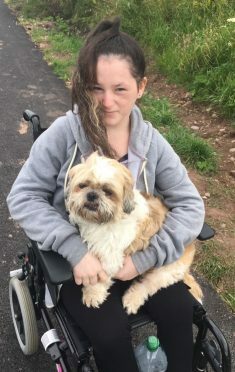 The mother of a teenager who suffers from fibromyalgia, ME and chronic fatigue syndrome has said the lengthy wait makes personalised care difficult. Elaine Sclater’s daughter Abbie, from Inverbervie, has suffered from chronic pain since she was a child. The 18-year-old’s mum said: “It’s difficult, especially if they are on a medication that takes eight weeks to build up and then eight weeks to get off. North-east MSPs Tom Mason and Mike Rumbles last night blamed “chronic underfunding” for causing waiting times to spiral out of control. But Public Health Minister Aileen Campbell insisted the government was working with boards where waiting times were long and expected them to address “exceptionally long” waits. NHS Grampian has said that it has struggled to recruit enough qualified staff to work in an “extremely specialised” field. A spokeswoman said: “We are continuing to provide the best service we can in the current circumstances and, in order to do that, we ensure patients are prioritised so that those in urgent need of treatment are seen first.